Mr Navalny had called on Kremlin critics to take to the streets ahead of Mr Putin's inauguration to register their opposition to what Mr Navalny says is Putin's autocratic Tsar-like rule. Mr Navalny, who was barred from running in the election on what he says was a false pretext, was detained soon after showing up on Moscow's Pushkin Square. Before his detention, he briefly addressed supporters in central Moscow, leading them in chants of 'Down with the Tsar!". Mr Putin won a landslide re-election victory in March, extending his grip over the world's largest country for another six years until 2024, making him the longest-lasting leader since Soviet dictator Josef Stalin who ruled for nearly 30 years. Navalny, who has been detained and jailed numerous times for organising similar protests, said he was proud to have made it to the rally. OVD-Info, a rights organisation that monitors detentions, said it had received reports of police detaining 1,599 people across Russia, nearly half of them in Moscow. It cited its sources at the Moscow protest as saying pro-Kremlin Cossacks had beaten protesters with leather whips, sparking a fight. Mr Putin, 65, has been in power, either as president or prime minister, since 2000. Backed by state TV and the ruling party, and credited with an approval rating of around 80%, Mr Putin is lauded by supporters as a father-of-the-nation figure who has restored national pride and expanded Moscow’s global clout with interventions in Syria and Ukraine. Police have broken up similar demonstrations in the past, sometimes harshly, detaining hundreds. Mr Putin has dismissed the opposition leader, who was barred from running in the presidential election, as a troublemaker bent on sowing chaos on behalf of Washington. 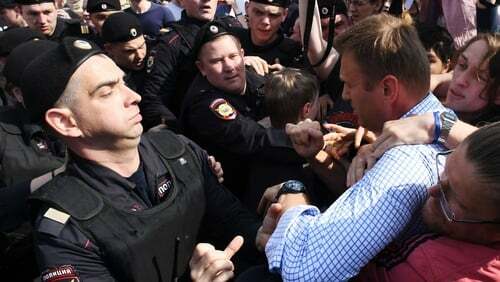 Prime Minister Dmitry Medvedev, a close Putin ally, has called Mr Navalny a political charlatan. Mr Putin is due to be inaugurated on Monday in a Kremlin ceremony heavy on pomp and circumstance. With almost 77% of the vote and more than 56 million votes, his March election win was his biggest ever and the largest by any post-Soviet Russian leader, something he and his allies say gave him an unequivocal mandate to govern. However, European observers said there had been no real choice in the election, and complained of unfair pressure on critical voices. Critics like Mr Navalny accuse Mr Putin of overseeing a corrupt authoritarian system and of illegally annexing Ukraine’s Crimea in 2014, a move that isolated Russia internationally.